What is this medieval saint doing raising the heavy metal horns? 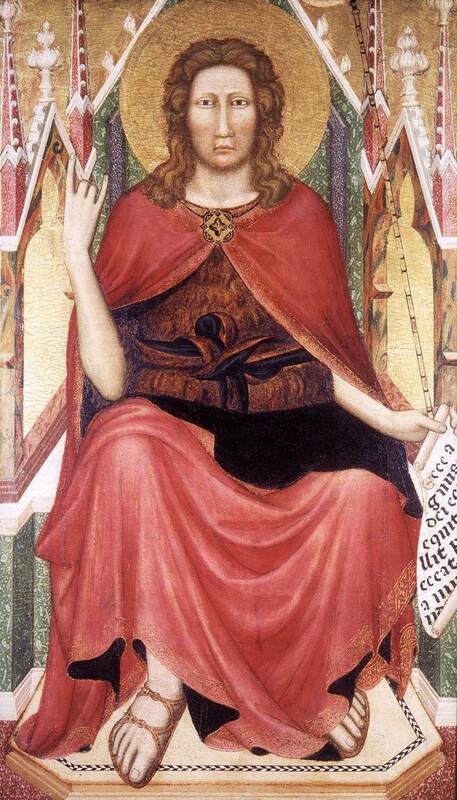 There’s a curious painting in Christ Church Picture Gallery in Oxford, St John the Baptist Enthroned. It depicts the precursor of Christ, J the B, in his trademark camel skin cloak, but rather than chilling in the desert, he sits on a magnificent marble throne with delicate Gothic canopies with finials and pinnacles with a luscious red robe draped over him. In his left hand, he holds his usual staff and a scroll which reads “Ecce Agnus Dei, ecce qui tollit peccata mundi”, essentially the saint’s catchphrase: “Behold the Lamb of God, behold He that takes away the sins of the world”. But his other hand, instead of pointing to the Saviour of mankind, is held in a very unexpected gesture. Perhaps appropriate for his rather bushy light-brunette mullet, he extends his first and little finger upwards, his second and third fingers curled into his palm with his thumb hidden behind. Someone who has grown up in the pop culture of the last thirty years can only read this gesture as one thing. ROCK. The picture was of course painted long before Blue Cheer even turned up the gain on “Summertime Blues”. It was painted in Italy, in the early 14th century: what art historians call the Trecento. It is characteristic of how artists of the time experimented with space and volume, away from the flat character of Byzantine icons. John is impressively bulkly and architectonic, something emphasised by the canting sides of his throne with foreshortened Gothic trefoil arches. The painting is first documented in the sacristy (a common dumping ground in Italian churches for old medieval paintings) of the church of Santa Maria degli Ughi in Florence. Around 1834 it was given to the library at Christ Church College Oxford: an unusually early interest in such a “primitive” painting. In 1857 it was exhibited at the great Manchester Art Treasures exhibition under the name Buffalmacco, a 14th-century painter famous from Georgio Vasari’s 16th-century Lives of the Artists as a great prankster, although he has no surviving signed works. Richard Offner’s Corpus of Florentine Painting now gives the artist as “Close Following of the Saint Cecilia Master”. Essentially, the painting looks very close to 1300, when the great Giotto was making a name for himself in Rome and Padua with the revolutionary plastic style of the Florentine School. So why did the anonymous artist of this panel paint the Baptist seemingly showing us how metal he was? The connection to the modern meaning is actually closer than you might think. John the Baptist was especially important in Florence: he was the patron saint of the city. The art historian Robin Simon, who wrote his MA dissertation at The Courtauld Institute on this panel, noted that the gesture first appeared on the florin financed by the Arte di Calimala, the Florentine guild of clothmakers, in 1252. 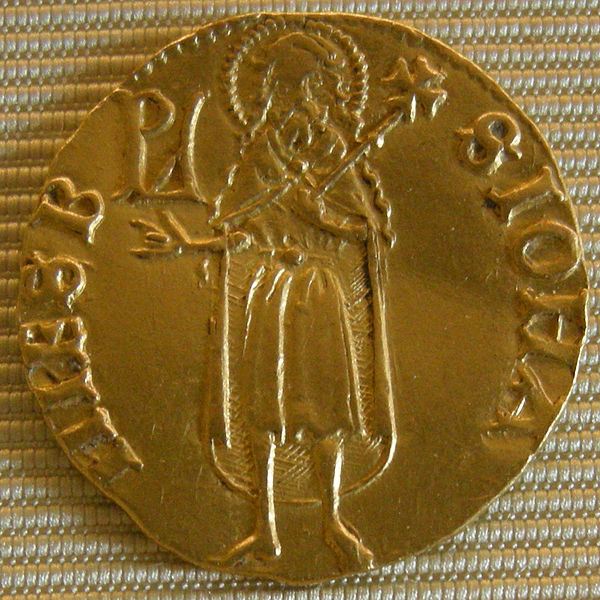 The fiorino d’oro stayed essentially the same in metal and design, with fleur-de-lys on the obverse and the city’s patron on the reverse until the end of the republic of Florence in 1533. While some mintings are too indistinct to see what John is doing with his right hand, and others do have him doing the usual finger-pointing-at-unseen-Saviour thing, many, like this fifteenth-century example clearly show him extending first and fourth finger like a laidback metalhead. Gestures are extremely important in medieval art and visual culture. They can also vary in cultural meaning, and the so-called “mano cornuto” is no exception. You can look at the Wikipedia page yourself, I’m sure, to see how it can be used to taunt a cuckold or support the University of Texas longhorns. But if the symbol fluctuates, the sign is rigid: horns. To understand why this saint is raising something so aggressive, it may help to look at the history of its current preeminent meaning in Western culture. A number of rock musicians used the sign of the horns in the early 1970s as a devilish symbol that resonated with heavy music’s use of the occult for counter-cultural shock value. 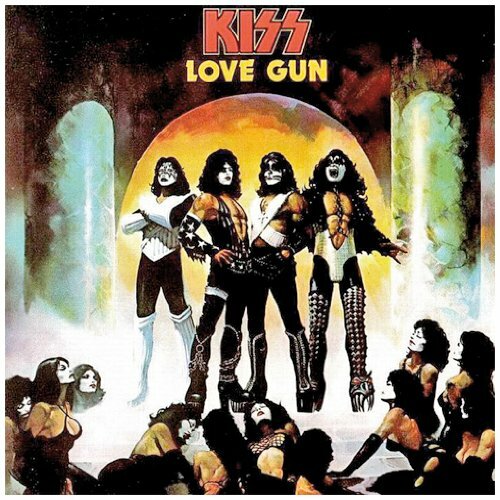 For example, on the cover of the KISS album Love Gun, entrepreneur and sometimes-bass guitarist Gene Simmons, in his trademark make-up as the character “The Demon”, emphasises his devilish nature with a horned fist. But the gesture became solidified in music culture by that much-missed and truly iconic vocalist of heavy metal music, the great Ronnie James Dio. Ronald James Padavona (1942 – 2010) had an extraordinary musical career beginning in New York state during the late 1950s, but coming to international prominence in 1975 when he and his band Elf were taken over by all-round British sociopath and Deep Purple’s guitar genius Ritchie Blackmore to be in his new band Rainbow. After he inevitably fell out with Blackmore, Dio joined Birmingham’s heavy-metal pioneers Black Sabbath in 1979 to write and record the Heaven and Hell album, the subsequent tour of which he popularised the sign of the horns during concerts. This was the first time a musician had really pulled the horns in a manner to encourage imitation in the audience (see the brilliant archive photo above). It came at just the right time: when Dio formed his own eponymous band in 1982, heavy metal was consolidating as a distinct genre rather than just a derogatory label for particularly heavy rock music. This gesture was just the sort of thing the burgeoning sub-culture required. 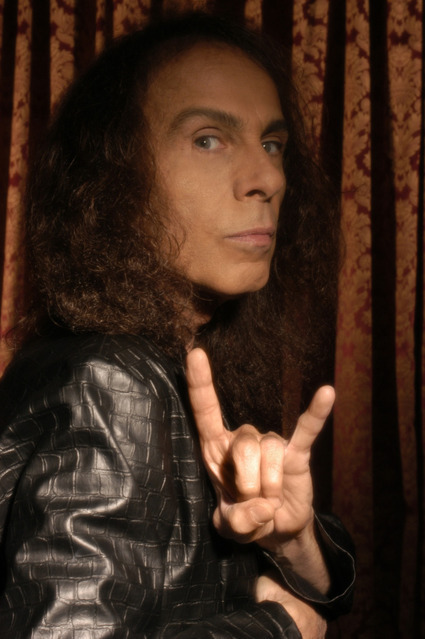 However, the traditional roots of Dio’s use of the gesture are subtly different from the way someone like Gene Simmons had used it as an attribute of mock-Satanism. Dio often told the story of his adoption of the horns, which takes us back to the part of the world this medieval painting came from. His parents were Italian immigrants who came to New York probably some time in the 1920s (it is hard to research because Ronnie was a very private person, allowing the notion to circulate that he was a decade younger than he actually was). He recounts how his Italian-born grandmother taught him the gesture to ward off someone giving you the “evil eye” (malocchio). In this sense the gesture is apotropaic: an image or symbol that has the power to ward off evil. And that’s what our 14th-century Florentine John the Baptist is doing. On the coins and the Oxford painting, he’s fulfilling his special role as protector of the City of Florence by exhorting them to stay hard as iron to scare away the devil and the malocchio of any other jealous city states through the use of a vernacular superstition. 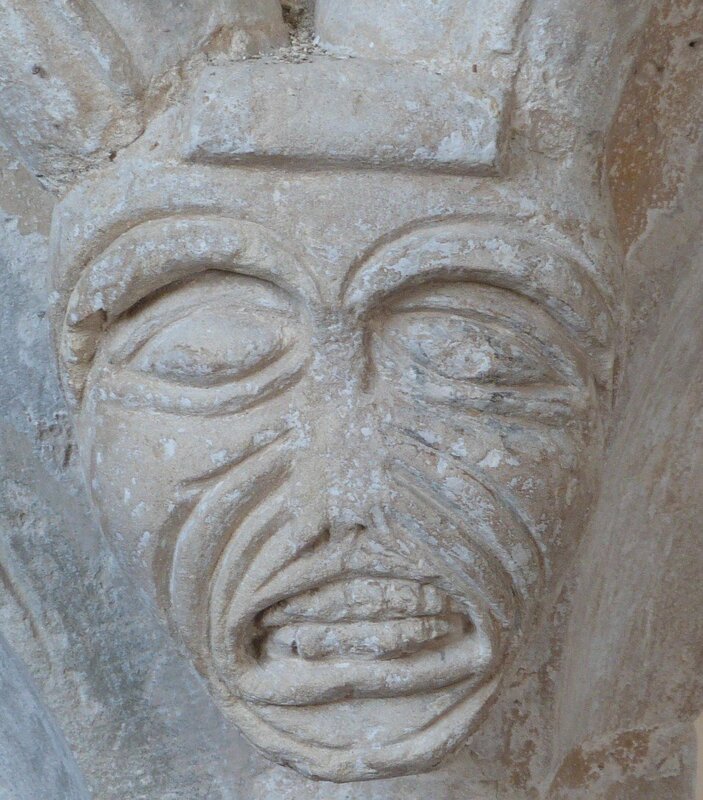 Grimacing pointy-eared face from the centre of the Tomb of Christ / Sacrament Shrine at Hawton (Nottinghamshire), late 1330s. So any initial surprise you might have at a medieval saint apparently giving the sign of the devil actually says a lot about art and culture. Dio’s lyrics show a fascination with the concept of evil. From his “Holy Diver”, facing the apparitions in the midnight sea to the night terrors that lurk in your own mind in “Dream Evil”. Of course, they are adolescent fantasy that pervades much of heavy metal, but not that far removed from the Middle Ages. As everyone knows, medieval artists put monsters everywhere, as apotropaic symbols but also acknowledgement and morbid curiosity in the darker side of existence. 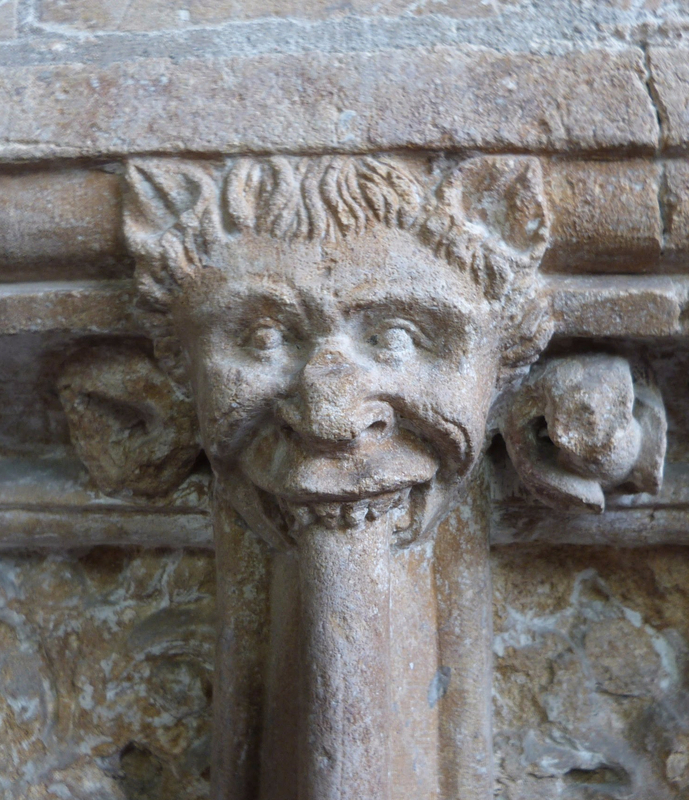 Church water spouts were in the shape of grimacing gargoyles who vomited down the rain onto the churchyard. The margins of rich people’s prayerbooks were full of bizarre creatures. The statues of saints on altarpieces were held aloft by all sorts of profanities we find difficult to understand. This is because the Church embraced everything: both the divine and the human fascination with the grotesque. Headstop between chancel sedilia and piscina, St Mary in the Marsh (Kent), probably last quarter of the 13th century: the spitting image of Iron Maiden mascot, Eddie. It reminds us that art should only be obsessed with virtue, but also explore notions of vice to understand the human condition. I often say it’s curious that the two genres of music I love to listen to that basically sound like white noise unless you sit down with the lyrics and concentrate are sacred polyphony (Josquin Desprez, Thomas Tallis, William Byrd, Palestrina) and death metal (Suffocation, Cannibal Corpse, Gorguts, Necrophagist). In some twisted way, this painting encapsulates that for me. On and on and on, it’s Heaven and Hell! This entry was posted in Art History, Heavy Metal and tagged apotropaic, Don't google image for sign of the cuckold when you're at work, Don't phone in it's just for fun, Florence, goldbacks, Headless Cross is the best Black Sabbath album, I made a post about Black Sabbath that doesn't mention Ozzy Osbourne and I'm proud of that, Medieval, medieval art, metal, painting, rock music on 10 September 2017 by James Alexander Cameron.